• 9- to 12-bit user-configurable resolution. • 1-Wire interface requires only one port pin for communication. • Has a 64-bit unique and unchangeable electronic serial number. • Multi-drop capability for simplified distributed temperature sensing. • Converts temperature to 12-bit digital word in 750ms (max.). • No external components required to sense temperature. 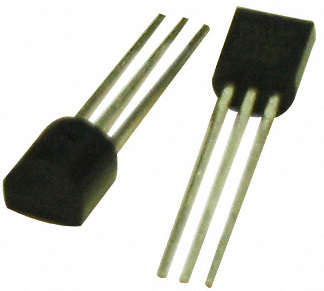 • 3.0V to 5.5V supply range. • 3-pin TO-92 (DS18B20) package. The DS18B20 is a digital thermometer featuring ±0.5°C accuracy over a -10°C to +85°C range. Data is read out over a 1-Wire serial bus in 2's complement format with 9 to 12 bits of resolution (user-programmable). The DS18B20 offers thermostatic functionality with over-temperature (TH) and under-temperature (TL) user-programmable setpoints stored in on-chip EEPROM. An internal flag is set when the measured temperature is greater than TH or less than TL. If thermostatic operation is not required, the two bytes of EEPROM reserved for TH and TL may be used for general-purpose nonvolatile storage. Each DS18B20 features a unique and unchangeable 64-bit silicon serial number, which serves as the bus address for the sensor. This allows multiple DS18B20 devices to coexist on the same 1-Wire bus. The DS18B20 is powered via a 3.0V to 5.5V power supply.